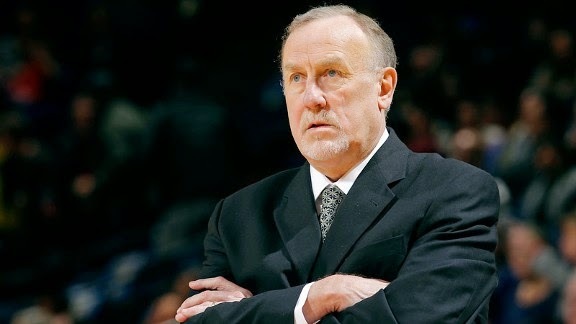 To piggyback on the previous entry on the Princeton Offense, I just wanted to take a moment to highlight Rick Adelman who employed a version of the Princeton offense in the NBA. I enjoyed watching Rick Adelman's teams play. I enjoyed the free flowing way they played offense. In a nutshell, the principles of Rick Adelman's system is: all five players must be engaged, move the ball quickly, be aggressive in the read and react. The Rick Adelman system also allows players to make decisions and be creative. As shared in the ESPN.com article "The Book on Rick Adelman:"
Adelman isn’t looking for one specific shot in a possession. He imagines a range of positive outcomes and has created a framework for achieving one of those objectives, which we know generally as the corner offense. The corner isn’t so much a system of play calls as it is a systematic way to promote ball and player movement through smart reads. Multiple players are involved in just about every possession, which keeps offenses humming and players happy. At its most basic, a corner set will feature three players on the strong side -- at the wing, corner and a big man at the elbow who has the instincts and skills to facilitate offense on the fly, players such as Chris Webber, Vlade Divac or Brad Miller. Offensive players size up the defense, then choose an action that best exploits what the defense surrenders. In short, read and react. In my research of the Princeton Offense I found another article on Rick Adelman, this one by Jonathan Feigen, which I thought I'd share excerpts from. If you're a motion offense guy like myself, some of the points raised will get you thinking about the beauty of a democratic offense that gets everyone involved. It has been called the Princeton offense. But despite some similar backdoor cuts, it is often far different from the offense Pete Carril took from his 29 years at Princeton to Adelman's Kings staff and the Hall of Fame. The term "motion offense" has been tossed around, and there is a lot of motion. But a college motion offense does not go against a 24-second clock that rules everything in the NBA. And Adelman uses far more "two-man game" with more post-ups than any college motion offense. It is basically a movement-based, read-and-react NBA offense. When run well, Adelman will resist calling plays, instead letting his players determine where the ball goes based on what they see in the defense. Wing players cut to the basket. Centers and power forwards often play outside and pass toward the basket. Every cut is followed by more movement to maintain spacing and create open shots if defenders overreact to the cuts. "Basically, it's a series of three-man game and two-man game," said Rockets assistant coach Elston Turner, a six-year assistant with Adelman in Sacramento. "If the three-man game doesn't work, you flow into a two-man game. And at the right time, it's one-on-one. "As a general rule, we allow our players some freedom to show their skills. We believe the spontaneous creativity, things that happen in the spur of the moment based on what the guy in front of you does is the hardest to guard because you can't prepare for that. "It's exciting to watch and it's exciting for the guys to play in. If you have the ability to play, we allow you to do that." Adelman said his best offensive players…will still be put in position to do what they do best. But players rave about the democracy and freedom in the offense so much, they might as well be running for office. There's no understating the influence of Rick Adelman whose offensive schemes have influenced basketball coaches on all levels of competitive basketball. His Corner Set offense can be found throughout the NBA. Coaches on any level can look to it and study it and see that it's a perfect balance of structure and freedom. It's a system of basic rules, but is also a system in which players are free to operate within them as they see fit…a truly democratic system that any player would love to play in.